It’s sleazy; it’s noisy; it’s juvenile. But it’s rather good fun, nonetheless! Lets start with the bad points first. Willie Nelson’s version of Uncle Jesse would make Denver Pyle turn in his grave. This is a pot-smoking, moonshine drinking, swearing old outlaw who garners very little audience empathy. His scenes are mercifully brief,(almost to the point of making his character an irrelevance) and his sole contribution appears to be that of a rather ribald comedian. In contrast to Pyle’s interpretation of the character as a gentle god-fearing bringer of wisdom, Nelson plays the man as a lecherous old wise-cracking hippy. Jessica Simpson’s Daisy is an anaemic character with few lines of dialogue, whose main purpose is to strip off down to a Bikini every once in a while for the purposes of emotional blackmail. As such, Simpson fits the role well enough; but the gentleness and warmth of Catherine Bach’s Daisy is completely absent. Bo and Luke (Sean William Scott and Johnny Knoxville) are loud, fairly dumb, raucous and pretty much interchangeable as characters, but their manic charm is actually rather enjoyable. Yes, these good ol’ boys are not the same as the Bo and Luke of fond memory, but the actors do at least strive to give them full-bloodied personalities in their own right and are none-the-worse for that. Their chemistry together is quite potent and they produce many funny (predominantly slapstick) moments. It’s juvenile humour; but, taken on its own, perfectly entertaining. Burt Reynolds as Boss is far removed from Sorrel Booke; but, once again, the fact remains that an actor has every right to make a fictional character his own and Reynolds does his best with a somewhat under-written part. I doubt he looked upon this role as anything more than a ‘take the money and run’ acting job, but he succeeds in making the character amusingly villainous without being actually threatening. Roscoe is your absolutely bog-standard sinister corrupt Southern Sheriff (no humour here),and Enos exists solely for the purpose of swooning once or twice over Daisy. Out of all the characters, only Cooter (after the General) comes close to the original. Of the remaining participants, the Duke’s paranoid friend Sheev is entertaining and fits nicely within the scenario. The plot is essentially the same as that of “Farewell Hazzard” from the 5th Season. Boss wants to strip-mine Hazzard, and stages a cross-country road-race at the exact time that an official hearing is taking place at the Courthouse, thus ensuring that none of the county’s citizens attend to legally voice their opposition. 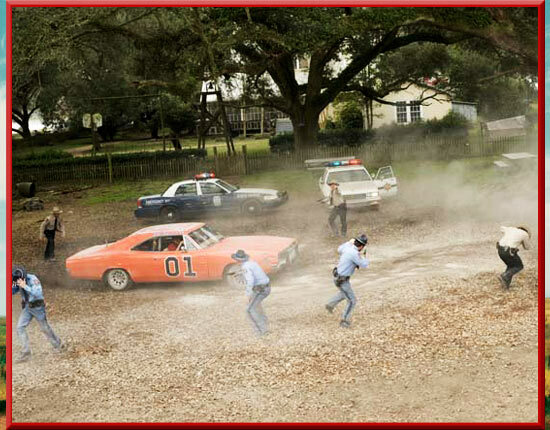 It’s up to Bo and Luke to win the race AND make it to the Courthouse on time. It’s a serviceable plot for the type of entertainment required and maintains the viewer’s interest well enough. The strengths of the film are Bo and Luke’s interaction with one-another; some occasionally inspired physical comedy (The safe surfing interlude; the masquerade as Japanese scientists) and plenty of robust automotive action. Indeed, the chase sequences are staged with an adrenaline-charged frenzy and usually culminate in a typically death-defying flight of the General Lee. And there lies the rub – this is The General’s movie, no doubt about that. He skids, slides, wheelies, 180’s, 360’s and flies like no other car. Alright, his acrobatics are fairly unoriginal as car stunts go; but The General is such an iconic image that he really only needed to drive past the camera in order to get the audience enthusiastic! No other car could make as simple an action as sliding round a traffic roundabout so exciting, and when he takes to the skies (there are three really impressive jumps and countless smaller ones) the films manifold faults just seem to melt away. Never has that orange 69 Dodge Charger looked so good! There are many fans who will hate this film, and with good justification. It reflects very poorly on its source material, and its storytelling is hardly inspired. 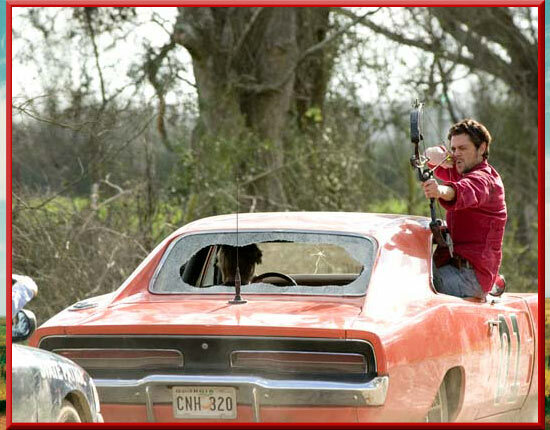 But looked upon as a loud, fast-moving, stunt-filled raucous comedy it certainly fits the bill.